So I was looking up traditional Irish recipes to see if I could make something to blog about for St. Patrick’s Day (anyone like how I completely blow past Thanksgiving, Christmas, Valentine’s Day and even Pi Day – Pie Day!! – and then decide to make a themed recipe for a holiday that’s way more about drinking than eating? What can I say, I gotta follow my muse!) and I discovered Colcannon. 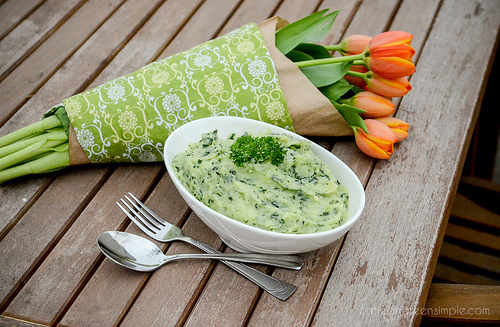 I’ve never had Colcannon before, and while it sounds vaguely familiar, didn’t really know what it was. Turns out it is essentially mashed potatoes with kale mixed in. Mashed potatoes. With Kale! 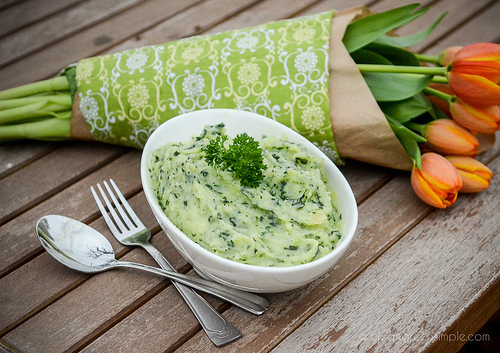 What could possibly be better than taking mashed potatoes and then adding kale to them? OK, I know some of you are probably thinking “Taking mashed potatoes and…not adding kale to them?” But bear with me because the final dish is pretty and tasty and really doesn’t feel like you’re eating leafy greens. 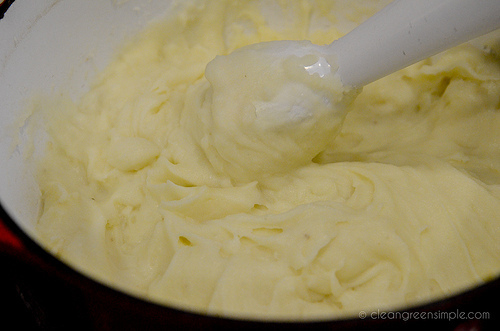 It’s also not much harder than just making mashed potatoes, which as I’ve discussed before, is easy. Just peel and chop up your potatoes into 1/2 – 1 inch pieces (you don’t actually have to peel them if you like the skins, but I wanted a nice clean white and green dish so I ditched the skins for this one). 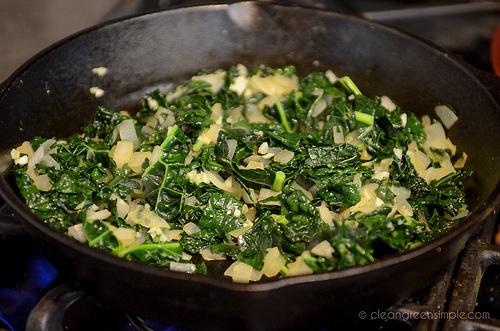 I chopped it into maybe 1 inch pieces and ended up with about 6 cups of chopped kale, which I added to the skillet. You could also use a regular blender or food processor, but I decided to use the stick blender for the potatoes as well so I stuck with the one tool because I don’t like washing dishes. 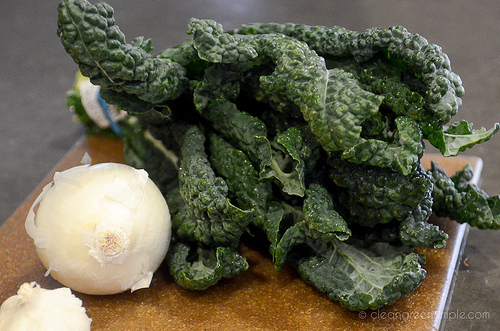 Anyway – once you have your kale, onion and garlic puree, the potatoes should be pretty close to ready to drain and then return to the pot or put in a large bowl. 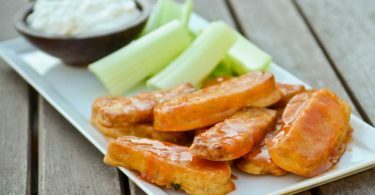 Drizzle them with just a bit of oil and salt and smash them with a fork or hand mixer or hand blender – it really just depends on how smooth you want them. The ones I made were super smooth to the point of being a tiny bit gummy, but that’s exactly what I was going for. Add about a cup of soy, rice, or hemp milk (I would recommend avoiding the nut milks because they tend to have a slight flavor that doesn’t jive with mashed potatoes in my mind, but if you know what you like, by all means use it!) and blend or mash until the potatoes have the consistency you want. Once they are ready, just toss in the kale mixture and stir everything together. So pretty! I think my favorite thing about this is that the kale and onions add enough nutrition that this can really feel like a meal on its own instead just of a side dish. Because who am I kidding, I already eat mashed potatoes as a meal anyway so I may as well get some leafy greens in there. Anyone have any St. Patty’s traditions they are looking forward to tomorrow? Bring a large pot of water to a boil and add the potatoes. 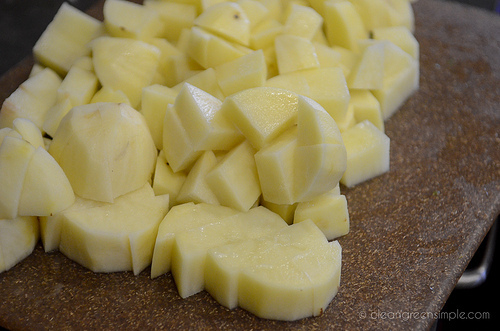 Boil for about 15 minutes or until the potatoes have softened enough to be easily cut with a fork. Drain and rinse potatoes and add to a large bowl. While the potatoes boil, sauté onion in a medium skillet over medium heat until translucent and just starting to brown. Add kale and stir, heating until the kale wilts down and softens. Add garlic and sauté for about 30-60 seconds until fragrant. Remove kale mixture from heat and either blend in a food processor or blender, or use a stick blender to puree it in a medium bowl. Set aside. 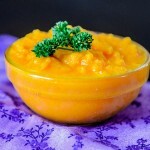 Using a hand mixer or stick blender, blend together potatoes, oil, and milk until smooth. Add salt and pepper to taste. 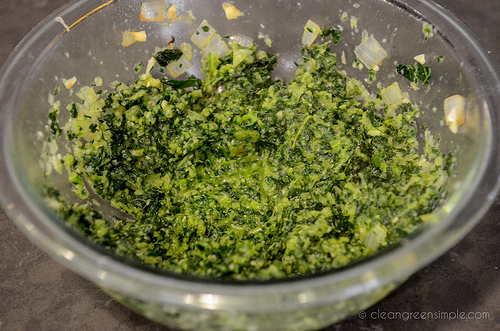 Add kale mixture to potatoes and stir together with a spoon. Serve immediately. Using kale for this classic was a great idea! Any excuse to eat kale, especially since it’s green for this holiday, is good in my book. We don’t get kale here… I wonder what I could substitute? Spinach? My wife and I both love kale. We both like potatoes, but my wife REALLY LIKES POTATOES!!! This looks like an excellent dish for both of us. Note: I spent 2 years in the U.K.. They have a dish called: “Bubblin’ Squeak” that can be vegan. At first I thought they were tryin’ to pull one on the “Yank”! But, I didn’t bite and over time I kept hearing about “bubblin-squeak”. So I asked about it. I was told that the “missus” saves all of the left-overs. Then once a week or twice-a-week. the “missus” will make mashed potatoes and mix in the saved leftovers. She will place the mixture into a frying pan and set it on low heat. As the mixture heats up it starts to: “bubble and squeak”! After I received the explanation, I set about to verify it;. Everyone that I talked with did verify the story about “bubblin’ squeak”! 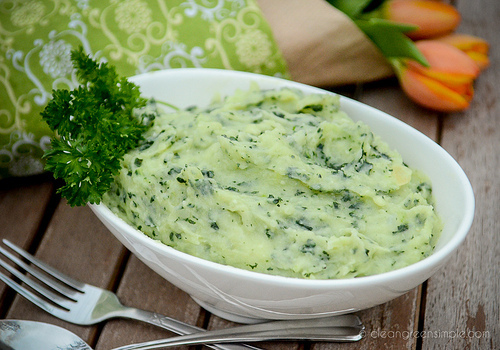 Since kale is green and when mixed with mashed potatoes you end up with “green-fleckted”: mashed potatoes. Could this be the “Irish” intent? 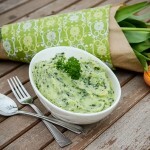 Here nor there, we think the potato-kale mixture is superb!!! Thanks for the recipe tip!! !